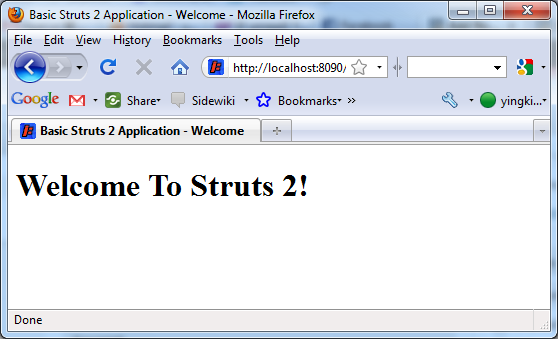 Struts 2 – Setup a Struts 2 Web Application in Maven | Eureka! I follow the Struts 2 tutorial and setup a simple Struts 2 application. 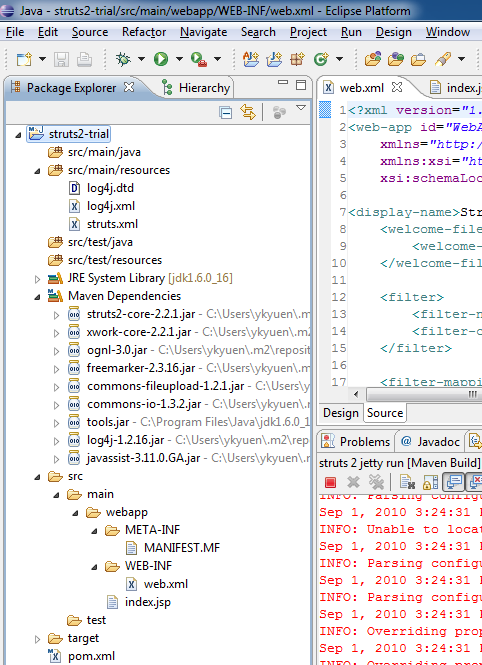 I used the struts2-core version 2.2.1 and also added a maven-jetty-plugin for running the web application. But when i run mvn jetty:run, the following error is found. java.lang.IllegalArgumentException: Javassist library is missing in classpath! Please add missed dependency! It is found that in struts2-core version 2.2.1, the Javassist dependency was excluded in OGNL. So i have to add this dependency in the pom.xml by myself. So here comes to the project details. do i have to create an action calss ? index.java. ? to be referencen in the struts.xml ? i am not very sure, but i think it is not a must. you mean u want to remove the maven-jetty-plugin? probably you can still build the project without any problem because the jetty plugin is for starting the java web application. sorry, didn’t get the meaning of your question. do you mean you want to deploy it to Apache? it cannot be done becoz it has to be run on Java app server like tomcat or jetty. can you brief me the steps to test the struts Action classes along with the interceptors and validation.xml files…? which jars needs to be used…? manual deployment to tomcat can be done by copying the .war to the tomcat webapp folder. About writing unit test, frankly, i haven’t done it before so i couldn’t give you any suggestions. but the following links maybe useful to u to get start.